DENTON, Texas — Designing a vocational truck can’t be easy. Of course these customers want a truck that’s tough and durable and one that can be easily fixed when inevitable damage is incurred on crowded job sites. But when you’re paying well north of six figures for any piece of equipment – especially one you’ll be spending most of your waking hours in – you want it to be comfortable and nice to look at as well. And vocational customers are increasingly becoming aware of the need for fuel efficiency, even if their time spent on the highway is limited. Peterbilt’s 567 set-back axle vocational truck was introduced last year to eventually replace the Model 367. It was designed at the same time as Peterbilt’s on-highway Model 579 and shares the same 2.1-metre aluminum cab. There are many similarities between the 579 and the 567, but also some key differences to meet the requirements of vocational users. Both models have cabs built of stamped aluminum panels, pieced together using Hemrobs to provide a stronger connection than traditional huckbolts offered. 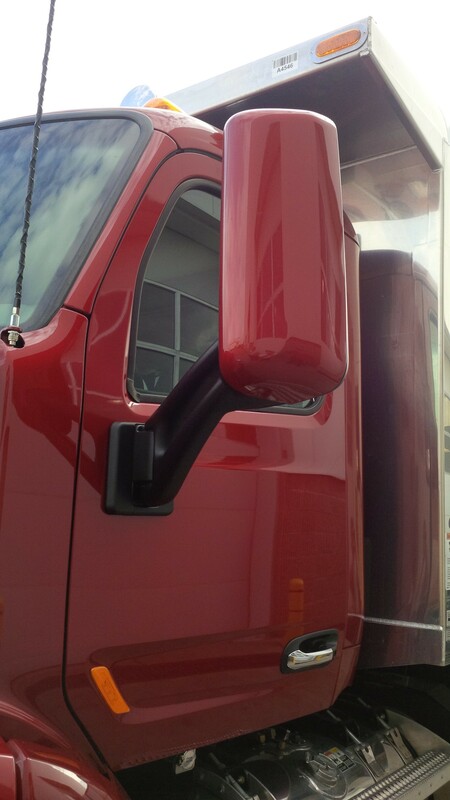 The mirrors on both trucks have been moved from the A-pillar to the door, to provide better visibility out the side windows. A three-piece hood has also been incorporated into both models so that repairs can be made more cost-effectively by replacing just a single panel rather than the entire hood. The biggest difference between the two models, as seen from the front end, is the headlight design. The 567 offers practical, externally-mounted pod-style headlights that can be more easily replaced when damaged. 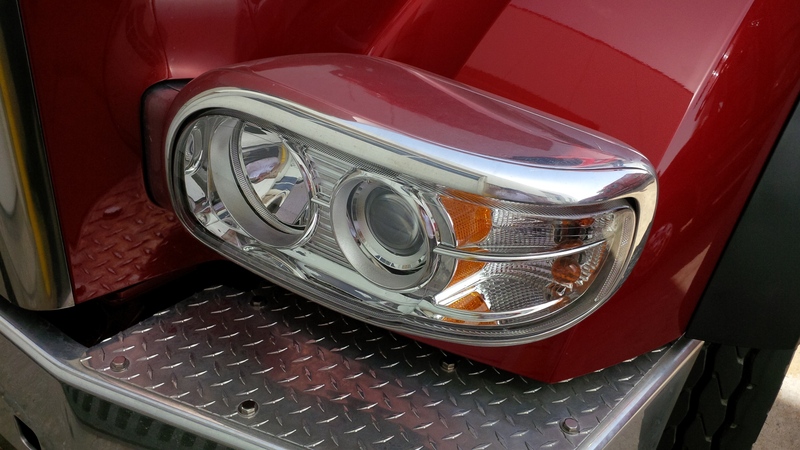 And when fender damage occurs, the headlights can be saved, whereas models such as the 579, with an integrated headlight design, may require the entire headlight assembly to be replaced along with the fender. The external design also simplifies the replacements of bulbs for vocational users. Of course the ride height of the 567 is higher than the 579, to allow for easier navigation of construction sites and off-road environments. Both models feature a deer strike bar that runs horizontally behind the grille but before the radiator. This is a clever feature as it can limit damage when wildlife strikes occur and – unless you’re in an area frequented by moose – eliminate the need for a bulky, heavy moose bumper. I drove an unloaded Model 567 dump truck while visiting Peterbilt in August and found the truck rode very smoothly, even on bumpy under-construction back roads. Visibility out of the truck was excellent, especially out the side windows thanks to the door-mounted west coast mirrors. 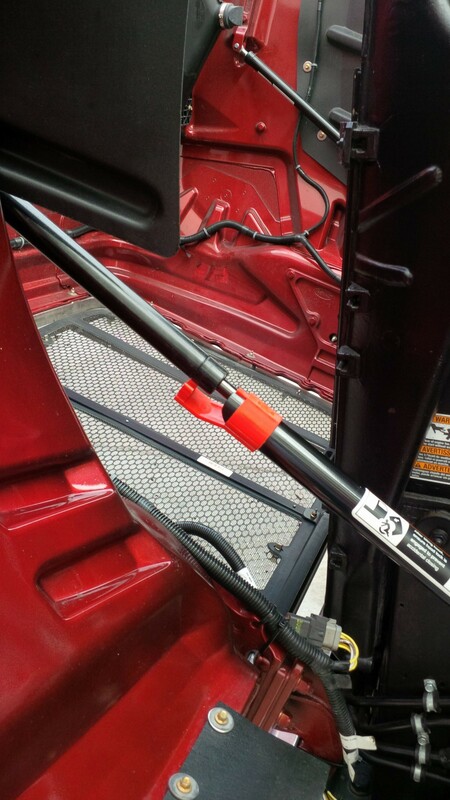 A small secondary mirror mounted above the passenger door provided a good look down the passenger side of the vehicle, improving safety while in traffic. Another visibility-improving feature is a lower beltline, which provides bigger side windows. A blow-down protection latch keeps the hood from catching wind and slamming down on a driver’s head. The 567 has a large panoramic windshield that’s taller than before, so it’s easy to see overhead stoplights. As far as I’m concerned, the more glass in the cab the better for visibility when working on construction sites. Some operators in vocational environments prefer a two-piece windshield because it’s less expensive to replace just half a windshield if you get a chip or crack. The flip side of this is that a one-piece windshield provides a completely unobstructed view. Whether a one-piece windshield is any safer can be argued all day long, but some companies in the oilpatch have taken that view and have made it a worksite requirement. As with its on-highway sibling, the 567 features an easy-to-open hood and anti-blowdown locking mechanism; however on the 579 it locks automatically while 567 owners have to engage it themselves. Servicing the truck and doing a pre-trip inspection is easy, since all the fluids that need to be checked regularly are housed on the driver’s side of the vehicle. The air cleaners on the 567 are contained underneath the hood, with an optional pre-cleaner available if the truck will be servicing dusty environments. The mirrors are now mounted on the doors of the 567 and 579. Climbing into the 567, you’ll notice a larger door handle that can be easily grabbed onto with work gloves on. Designers refer to this door handle as the “handshake to the truck” and they’ve put more thought into its design than you’d ever imagine. The door features a triple seal to eliminate wind and road noise and an air-over-electric system has reduced the number of pass-through holes into the cab, further reducing noise. 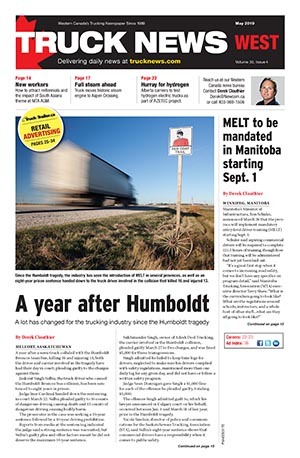 “The goal is to not have to dig around in the cab to find an air leak and the less pass-through holes you have in the cab, the quieter it is,” Peterbilt marketing manager Anthony Gansle explained on our drive. The 567 comes standard with air disc brakes on the front axle and Bendix electronic stability control. Weight-sensitive customers can still opt for drum brakes on the front end and some do. The truck I drove was powered by the Paccar MX-13 engine (430 hp/1,550 lb.-ft.), which has been continuously tuned to meet the needs of vocational operators. Just this past summer, new vocational features were built into the engine. Gansle said the 13-litre MX engine allows about a 400-lb weight savings over a 15-litre and can produce up to 500 hp, striking a good balance between power and efficiency. The 567 has well-positioned hanging pedals that are comfortably placed. Again, this has eliminated pass-through holes at the bottom of the pedals which previously allowed noise to enter the cab. The HVAC system on the 567 is exceptional, though I can only attest to the A/C since I was driving the truck on a hot August day. It’s a set-it-and-forget-it system that quickly reaches your desired temperature and then holds it. This Model 567 featured the Eaton UltraShift Plus VMS (Vocational Multipurpose Series) automated manual transmission. It shifted smoothly but we were unladen and as such, didn’t have the chance to really put it through its paces. 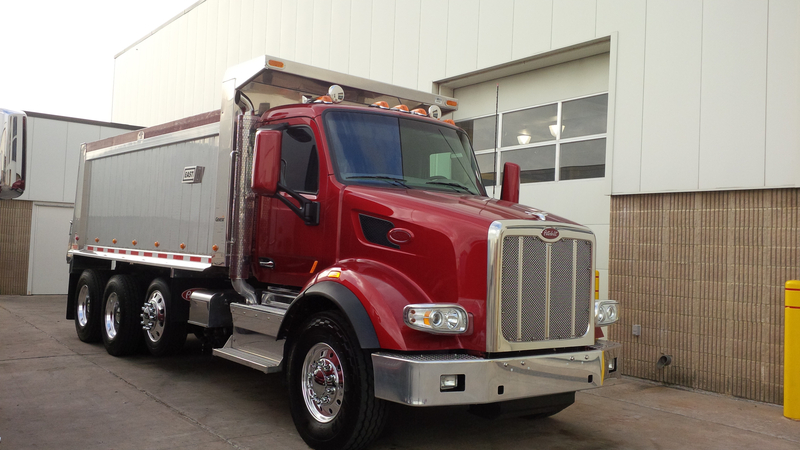 If you’re looking for a vocational truck that looks great, provides excellent visibility and a smooth, quiet ride, the Peterbilt Model 567 won’t disappoint. The set-back axle configuration is a good fit for applications such as dump, roll-off, mixer and any others where a SBA is suitable. 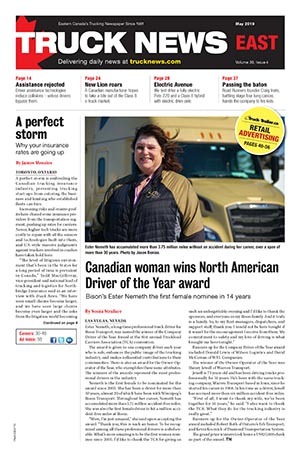 A set-forward axle version of this truck is being developed and will enter pre-production late this year. In the meantime, Peterbilt will continue offering the Models 365 and 367, at least until every option currently available on those models can be had on the 567.